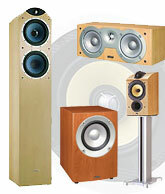 Tannoy’s Dual Concentric drive-unit technology has long been famed for its coherence and pin-point imaging ability. Now, in the Arena home theatre package, those same advantages become available to home cinema enthusiasts on a budget. The satellite speakers – tiny, futuristic vented aluminium enclosures – house a new 100mm Dual Concentric driver with 19mm titanium dome tweeter. The centre speaker includes an additional 100mm woofer for extended low end while the highly-configurable active subwoofer has on board a 300W digital amplifier. And the really good news? It works as well for music as it does for movies. The new PM-15S1 proves Marantz is still a serious force in audiophile two-channel music equipment. This amplifier, successor to the legendary PM-17, completely justifies its membership of the high-class Premium component range. Luxury touches include a shimmering solid-aluminium fascia and a solid metal remote control. Advanced technology includes an accurate electronic volume control. And thanks to a unique four-way stacking option, with central channel steering, the PM-15S1 is ready and willing to lend its natural, powerful sound to movies as well as music.